The Magician Tarot Card is an outstanding omen that symbolizes new opportunities. It can also show the significance of new enterprise and that you will have the creativity and willpower to succeed in whatever you may set out to do. The typical mercurial nature of The Magician Tarot Card translates to you being able to think on your feet. It can also mean you will be able to bluff your way through any difficult situations. However, negatively this card can represent deception or trickery and is a stern warning to be careful of those you place your trust in. One further negative aspect of The Magician to note, is that it may suggest that you are being indecisive and lacking in self-confidence. The Magician Tart Card can also mean that a manipulator is floating around. This is usually if the card is reversed. They may be a beneficent guide, but they do not necessarily have our best interests in mind. They may also represent the persons ego or self-awareness. They can also represent intoxication of power, both good and bad. The twenty-two cards in the Major Arcana are crucial to any particular Tarot reading. They are all reflective of the road that a person must make when reaching self-awareness. They will teach people about what they can do in order to improve their lives. One such card that may be drawn in the Tarot deck is the Magician Tarot card. 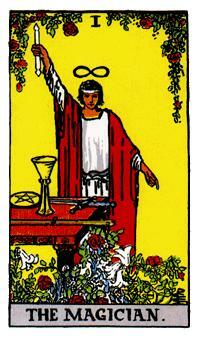 The Magician Tarot card is a card that features an image of a person who appears to be holding a wand. He is near a table that features a few added materials including a sword, a cup and even some coins depending on the artwork that is used within the card. The details in this card can be rather interesting as they can entail many meanings. The card appears to be one that is inspired by the planet Mercury. It focuses on intellect and logic. In particular, it also focuses on the number one as it is reflective of beginnings in life. The hands of the Magician appear to be pointing in different directions. The left hand points towards the ground while the right hand with its wand will point upward to the sky. The right hand appears to be taking the power of the universe and is moving it right into the physical world. It is as though his hands are being used as a conduit to where the powers of the universe and the heavens are being shifted towards the physical world. The materials on the Magician’s table might vary in appearance based on the deck but they are all materials that are reflective of the four alchemy elements. They entail the use of the mind, body, heart and soul. A mix of red and white is also used in the Magician’s outfit. The red is representative of experience and understanding while the white is reflective of innocence and the desire to stay pure and happy. There are also a number of roses found at the very bottom. Located under the table, the roses are symbols of the passion and aspirations that people often hold in the behaviours that they engage in. These roses may also be mixed with some other flowers to create a varied approach to the goals that one wants to hold. An infinity symbol or a hat that is shaped to look like the infinity symbol in some way may also be added over the person’s head. The symbol will be reflective of the way how the knowledge and attitudes that one might hold will continue to last for one’s entire life if used right. As simple as the card might look, the individual features of that card make it all the more important to explore. The Magician Tarot card is made with many meanings in mind but it is all whether the card is upright or reversed that might be a critical factor with regards to making sure one’s decisions are being made the right way and with enough control over what one wants to do in one’s life in general. The greatest aspect of the Magician Tarot card, like with any other card in the deck, is that it is reflective of the influence in behaviours that one must follow. The card focuses on the lessons that one must follow in order to reach enlightenment and to have a better life. Specifically, the card is reflective of one of Carl Jung’s patterns of influence and behaviour. That is, the Magician is symbolic of the things that one may do in order to go places and become more successful and advantageous to the world over time. The Magician Tarot card can be held in an upright position where the right hand is the one that is facing up. This means that it is in its upright meaning. If the card is upright then it means that there is a semblance of knowledge and skill within the person’s life. It focuses on the need to concentrate and the overall resourcefulness that a person might hold. This can be a sign of how a person might need to make some kind of change in one’s life in order to reach enlightenment. A person might consider a need to go to a school of higher learning or to become more assertive in terms of any form of leadership that one might attain over an extended period of time. If the Magician Tarot card is upside down as it is drawn then that means the card has been reversed. In this case, the card will be symbolic of a person who does not have much power and is being manipulated by others in some way. In other cases it can be reflective of how a person has not even planning one’s life as well is that person is supposed to. This can in turn create a serious problem relating to how one’s life is to be organized. In addition, it may also suggest that a person has talents in some way but that person is not doing a thing to make them more visible or useful in society. The person is only hiding one’s skills and is too meek or worried with regards to trying to exert those powers upon society. In some cases this may entail how a person is using one’s skills for a limited audience at this moment and is squandering one’s potential. In particular, the rest of the world may benefit from the talents that one holds, thus making it all the more important for that person to share one’s talents and to do more with one’s life in order to potentially become more likely to succeed in society as a whole. The Magician Tarot card is a symbol of knowledge, purity and the need to use one’s skills. It may also be used as a sign that one needs to focus on improving one’s skills over time. Depending on how it comes about during a tarot reading, the Magician Tarot card can make a real difference in terms of how such a reading is to be run as necessary. The detail in this case can be rather intensive and needs to be explored with care.